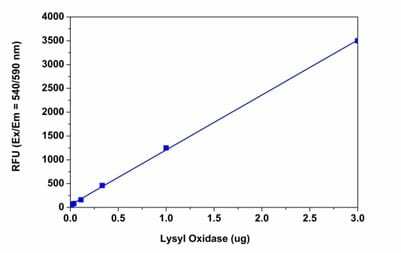 Lysyl Oxidase Activity Assay Kit / LOX Activity Assay Kit (Fluorometric) (ab112139) provides a simple method to measure lysyl oxidase (LOX) activity in cell and tissue extracts from mammals and other species, as well as physiological solutions. The LOX activity assay protocol uses a proprietary LOX substrate that releases hydrogen peroxide upon transformation by the LOX present in the sample. Hydrogen peroxide is in turn detected using a red fluorescence substrate for HRP-coupled reactions. This leads to increase in fluorescence that can be easily detected at Ex/Em = 540/590 nm in a fluorescence microplate reader. This assay is semi-quantitative as it does not contain a LOX standard for calibration. When a known concentration of LOX is used, the assay can detect activity from as low as 40 ng of lysyl oxidase in solution. The assay is highly sensitive and its unique detection method eliminates the interference that occurs in certain biological samples. Lysyl oxidase (protein-lysine-6-oxidase, LOX, EC 1.4.3.13) is an extracellular copper-dependent enzyme that catalyzes formation of aldehydes from lysine residues in collagen and elastin precursors. The activity of Lysyl oxidase in biological samples is traditionally assessed by tritium release end-point assays using radio isotope labeled collagen or elastin substrates. 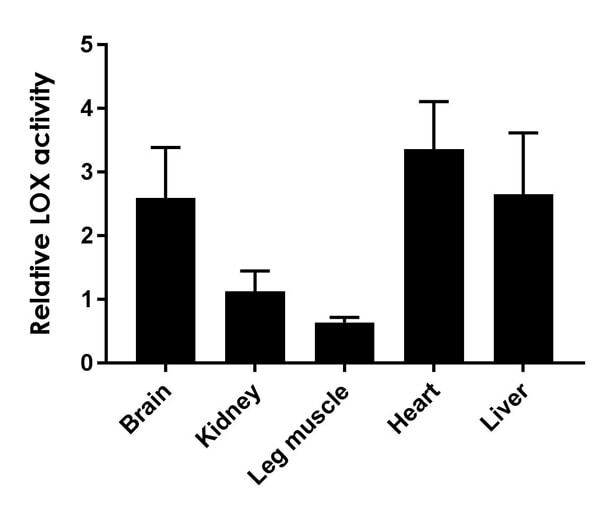 Relative LOX activity levels in mouse tissue. Tissue samples were prepared following assay protocol. Protein concentration was determined and samples were diluted 2-30 fold. LOX activity levels were measured after 15 minutes incubation in a fluorometric plate reader at Ex/Em = 535/587 nm. LOX activity levels are relative to background noise (blank control). LOX activity fluorescence (RFU) values vs quantity (µg). Recombinant human LOX2 was serially diluted 3.35-0.04 (1/3) and activity was measured following assay procedure. LOX activity absorbance (OD) values vs quantity (µg). Recombinant human LOX2 was serially diluted 3.35-0.04 (1/3) and activity was measured following assay procedure. Colorimetric detection is approximately 10-times lower than fluorometric. Typical lysyl oxidase (LOX) dose response curve. Known amounts of LOX were added to wells and reaction was run following assay protocol. Fluorescence was measured on a solid black 96-well plate using a Gemini fluiorescence microplate reader (Molecular Devices). Activity from as low as 40 ng/mL of LOX can be detected after 30 minutes incubation. Theoretically, azide should be compatible with ab112139 Lysyl Oxidase Activity Assay Kit (Fluorometric), though I am sorry we have not directly tested this so cannot provide data to confirm this. Compounds and buffer components that may interfere with the assay include DTT, glutathione (reduced form: GSH), β-mercaptoethanol, some detergents (such as Brij-35, Tween-20 and NP40), NADH and NADPH. The laborotory uses 500 uM BAPN from TCI, the cat# is A9754, and the cas# is 2079-89-2. In general the laboratory would recommend between 0.1 - 1 mM as most publications use BAPN concentrations in this range. Please see some example references attached. I am looking to purchase the LOX ELISA and as part of the product you do not provide LOX standards. Can you please give an indication of the product you use for standards for this ELISA, or where they might be obtained from? Please note that this kit is not an ELISA kit but an activity assay kit. Do you have any indication that frozen lysates can be used or to get optimal activity only fresh protein lysates can only be used? Frozen samples are suitable for use with this kit. Do you have you a more detailed protocol on the cell protocol? For cell lysates, the cells should be collected and then homogenized in PBS. After spinning down the cells, the supernatant will be used in the assay. 50 uL of supernatant will be added per well of the assay plate, and follow step C.1. in the protocol (page 10). What was the plate used in ab112139? I can confirm that Solid Black micro plate was used in experiment with top-reading instrument. The clear bottom black and solid black plates can be selected based on experimental set up and instrument. With this kit, should one use fresh or frozen samples? Also, are tissue extracts OK? 2. Are tissue extracts OK?--Yes. duplicate. Is it 0.04ng not 0.04ug? 2) Somebody bought the standard (cat#: 2639-AO) from R&D compamy because the kit doesn't contain it. Do I have other choice? When preparing the serial diluted LOX standard, using the assay buffer the kit provides or need to buy another one? about this microplate? Which company's product is better for this kit test? What is catology number? 1) Regarding the standard serial dilutions, you are correct it should be 0.04 ug to 4 ug. This has been updated in our online protocols, but older copies of the protocol may still incorrectly say 0.04 ng. Please make the standards starting with 0.04 ug. 2) You can use other LOX standard protein, but we suggest using the R&D product as that is what the lab uses. Searching on http://www.biocompare.com may give you other options of LOX standard. When preparing the standards, use PBS with 0.1% BSA or the buffer in your test sample. The assay buffer contains LOX substrate in it, so don't use it for your sample and/or standard dilution. 3) For the microplate, we suggest using Greiner Bio-one cat #655079. To test losyl oxidase activity(ab112139), when dealing with tissue samples, can I add protease inhibitor? I contacted the scientists in the lab about this question, and we have not tested the kit with samples containing protease inhibitors, but theoretically the kit should be compatible with protease inhibitors. It should be fine to add these to your samples prior to use with the kit.